Just like Justice League #12, ComicBook.com got an early look at Justice League International Annual #1, out today, and had a chance to read and digest it a little before it hit the stands. Our International Exchange column discussed some of our feelings on the matter, as did the review that just ran, but this issue is being tipped as a game-changer for the DC Universe at large--and it certainly has that feel. What all happened inside? Well...! 1. 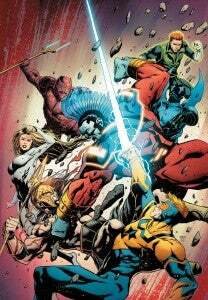 The Justice League International is history. The JLI as we know it is dead. Any members who didn't bail outright have other things in store for their future, something that was laid out pretty cleanly by a surprise guest star at the end of the issue. Booster Gold has apparently been doing all of this because he thought there was a role he had to play in history with this iteration of the Justice League International. Now, though, he's been told outright that somebody else is going to fill that role, and that he doesn't need to worry about it. Does that mean time has changed around him? Seems likely, given his reactions to some of the issue's revelations. 2. The Global Guardians are coming. Whether DC will actually try to resurrect the Global Guardians--a team that's been used more for cannon fodder than actual storytelling in recent years--and give them their own title is pretty unlikely...but either way, a number of the Justice League International's key members (including Godiva and August General in Iron, as well as newcomer The Olympian) will recover from this issue's brutal battle and go on to form the team that, in the original DC continuity, was its immediate precursor. Weird, huh? 3. Not all questions have answers. This might not be a fair observation, as there's obviously still time for these things to be resolved--but two major questions hang over the Justice League International ongoing series, which weren't resolved in this issue. First of all, we never did find out who it was looking at those monitors, twirling his mustache and wishing death on the JLI, did we? More likely than not, that'll turn out to be the new O.M.A.C. "master," whose identity actually seems pretty obvious from the bread crumbs left in today's Justice League issues, but that still leaves questions like what Jurgens had planned for the interface that Rocket Red seemed to have with the alien computer before his death...and who the hell was that mysterious woman who appeared on a couple of the series' covers, but never inside? Jurgens gave us a no-comment every time we asked about her, which seemed to suggest at the time that there was more story to be told. 4. Booster Gold, Volume II happened (at least part of it). The version of Booster Gold who was reinvented by Geoff Johns, Jeff Katz and Dan Jurgens as a Time Master and the father to Rip Hunter has at least some bearing on the way the character will be portrayed in the future, apparently. How much of the series can actually stand up in the world of the New 52 is questionable, particularly since Ted Kord was a major part of almost every arc and he never existed here. 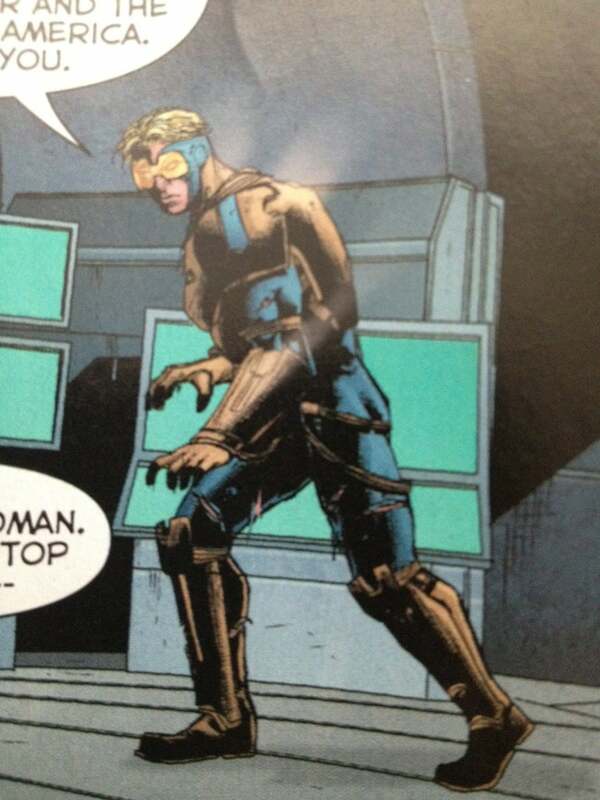 Still, the appearance of an older, more experienced and "dignified" Booster Gold, arriving on the scene and demonstrating mastery over time, all while name-dropping Rip Hunter, suggests that even though nobody's used it yet and even though Dan DiDio has expressed reservations over using time travel in the New 52 just yet, Skeets may still be waiting at Vanishing Point with Rip after all. And as an added bonus: Do you think this outfit here looks more like Booster's Extreme Justice armor from the '90s, or Rip Hunter's Time Master outfit, as depicted in Booster Gold, Volume II? I could go either way. If there's one story beat more tired than superheroes fighting other superheroes in the last ten years, it's got to be the Brother Eye/O.M.A.C. stuff. After years of being an annoying distraction, it was redeemed almost completely by Dan DiDio and Keith Giffen's stellar work on the O.M.A.C. monthly series, which was cancelled and apparently DiDio and Johns have decided to penalize the readers for it by putting us through all of that O.M.A.C. Project crap again. The identity of the new "Master" behind the O.M.A.C. Project is unclear as yet, unless you count the numerous hints dropped in this issue and Justice League #12...!